“A prophet is not without honor except in his native place and among his own kin and in his own house,” Jesus says in response to the incredulity of those gathered in his home synagogue. Even though the people recognize his wisdom and his mighty deeds, they fail to believe. They ask rhetorical questions: “Is he not the carpenter, the son of Mary, and the brother of James and Joses and Judas and Simon? Are not his sisters here with us?” “Rhetorical” in the sense that they already know the answers. The “questions” indicate an obstacle to belief, to repentance and to conversion of heart. The obstacle is put there by themselves. The rejection of the prophet and the prophetic voice may sound familiar. Jesus’ response conjures up many images from the Old Testament prophets where their message and person are met with rejection. Jeremiah is one example where the rejection is particularly vivid. The prophet is given this task for the need is desperate. The motivation is one of love. God sees that they are living far away from his way. They have forsaken the covenant that leads to life. God does not want them to live like this for it brings harm and leads to death. So the prophet is called to raise this awareness and to call the people back to God, back to the covenant and back to life. While some of the people turn back to the Lord others do not. Yet in the course of time the prophetic voice is recognized and appreciated; hence, we are today several thousand years later still hearing the message and called to conversion of heart. The refusal to believe goes deep into their hearts. In other words, they are being obstinate. There is a sadness here; for the obstinacy is robbing them of life and keeping them distant from Jesus even though he is standing there in their midst and looking at them face to face. The contrast mentioned is important for another reason. There were many “false prophets” in the life of Israel. These prophets were not “of God” and they led many astray. Such is not the case with Jesus because the people recognize his “wisdom” and “mighty deeds.” In other words they recognize his “authenticity,” but they still reject him. Jesus’ prophetic voice is continually raised and renewed in the life of the Church. Many times that voice is heard and the faithful are led to a deeper experience of life, love and mercy. At other times the voice is rejected only to be later recognized as prophetic. Today we hear that voice when the Church speaks, for example, on the dignity of human life from conception to natural death, on the sanctity of marriage and the family, on the care for the poor and needy, on the call to mercy, and for stewardship of creation. Questions we might ponder this week are: “When do I hear the prophetic voice?” “How do I ‘listen’ to the voice with an open mind?” “Do I ponder the prophetic message seeking truth and conversion of heart?” Jesus speaks the prophetic word in love. He calls people to believe, for faith brings life. His prophetic voice still sounds and calls us to deeper faith. Msgr. 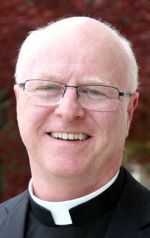 Joseph Prior is pastor of St. John the Evangelist Parish in Morrisville.